Fruit trees come in all shapes and sizes and so do their roots. This means you can choose exactly the right type for your plot – whether it’s a giant tree or one that can grow in a pot, there’s a fruit tree for you. When growing fruit trees you should mulch around them once a year with well-rotted manure, home compost or leafmould. This boosts the nutrient levels in the soil and replaces those that the tree absorbed during the year. They’ll also need pruning annually, and some fruits, including apples and pears will need to have their fruit thinned. This means removing some of the unripe fruits from each branch so the remaining ones grow to their correct size. What Rootstock Should I Choose? All fruit trees are propagated onto rootstocks. This means the plants are grafted onto the roots of another plant, from either the same family or a different, although compatible, species. This is done for a number of reasons, including promoting resistance to disease and growing traditional varieties as dwarf trees. The type of tree you buy is called the scion. Pear scions are sometimes grown on to quince rootstocks, for example. This is because quince rootstocks are smaller than pears’, so it enables growers with smaller gardens to be able to enjoy homegrown pears safe in the knowledge that their tree won’t grow too big. The rootstock you choose will therefore contribute to the size of the mature tree, how deep the roots grow in the ground, how hardy the tree is, how well it adapts to different soils and how long you’ll have to wait before the tree yields fruit. How Many Trees Will I Need to Buy? Most fruit trees need to be cross-pollinated by a different variety of the same fruit species. Some are self-fertile, though they will usually benefit from the presence of another tree. Make sure both varieties of tree you buy will flower at the same time, this will ensure pollinators such as bees will travel from one tree to the next, exchanging pollen and ensuring you get a heavy fruit yield. Most fruit trees enjoy a sunny, sheltered position. This is especially important if you are growing apples and plums, as they flower very early in the spring and the blooms can be caught by a late frost. What do I Want to do With My Fruit? You may have decided what type of fruit you want, but do you want cooking or dessert apples? Sweet or sour cherries? The type of fruit you buy will determine how you eat it. Dessert apples are sweet, and best enjoyed raw. Cooking apples are best used in pies as they have more of a tart flavour. You may want to make cider with your apples, in which case you should opt for a cider apple tree. Sweet cherries are delicious eaten raw and can also be cooked. Sour cherries are smaller, softer and rounder than the sweet varieties. Most of them are too tart to eat raw, but they are fantastic in pies and preserves. 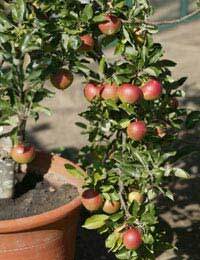 Whatever type of fruit tree you choose, make sure it’s the right one for you and your garden. If you look after it well it will provide you with many years of tasty, fresh fruit. Choice of rootstock is only one of a handful of factors which will determine the growth rate and mature size of the tree. The variety grafted to it can significantly affect how fast it grows. Bramley, for example, will grow much faster and larger than average, while certain other varieties are natural dwarfs and slow-growing. It is entirely possible to have a dwarf-ish variety on M25 roots (very vigorous rootstock, normally considered to reach about 5m)which grows more slowly than another variety on MM106 roots (semi-vigorous rootstock, normally considered to reach about 3m). The type of training, pruning or even the amount of pests and diseases the tree has to fend off can significantly affect its growth rate. Additionally - and often completely overlooked - is the depth and quality of the soil on which the tree is being grown. The amount of rainfall and the ability of the soil to retain moisture is very important. Chalky/dry soils are quite alkaline which can be very challenging for most types of fruit tree to merely survive - let alone grow! On dry and/or shallow and/or low-fertility soil it is often advisable to use a very vigorous rootstock because the poor growing conditions will make it behave like a semi-dwarf anyway. Most size guides given are for fast-growing varieties - such as Bramley - when grown in an ideal climate on an ideal soil and with full spray protection from pests and diseases. Many home growers have conditions which are far from ideal and therefore trees can be much smaller than expected when they have to contend with poorer soils and repeated attacks from pests and diseases.